It has been a long weekend for me. I was actually sick over this last weekend and as a result, I had to cancel/postpone all my work commitments so that I could get some rest at home and focus on recovering soon. But as always, whenever I have the full day to myself at home (and this time it was 2 full days), I just could not stay out of the kitchen. I know I am such a contradicting person but it seems like baking/cooking has a healing effect on me. This was a really well-spent weekend for me. Not only did I get some rest (away from work), I also managed to accomplish trying out many food items on my To Bake/Cook List. 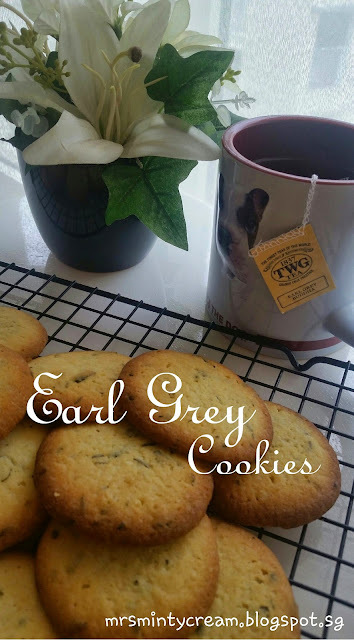 I am so excited to share these recipes with all of you on MMC. I promise, you will soon see the following recipes coming up on MMC. Another good thing about a well-spent weekend is that you will wake up on a Monday morning, feeling great about the start of the week ahead. This was exactly how I felt this morning! 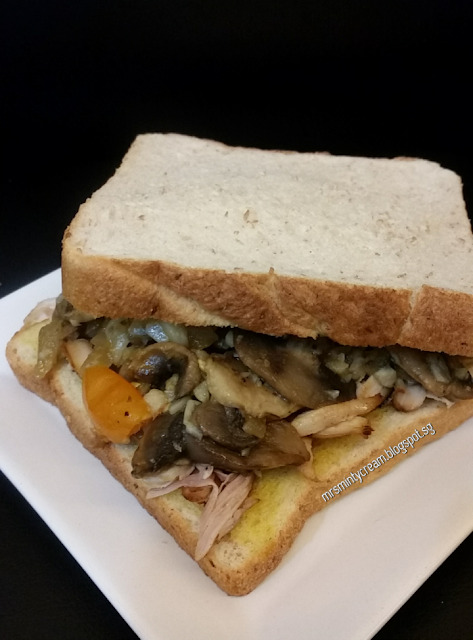 To kick start the week ahead, I decided to put in a little more work into this morning's breakfast and this was what I came up with - Chicken with Mushroom Sandwich. Mind you, I added a little bit of wine into this recipe and the result was EXCELLENT. 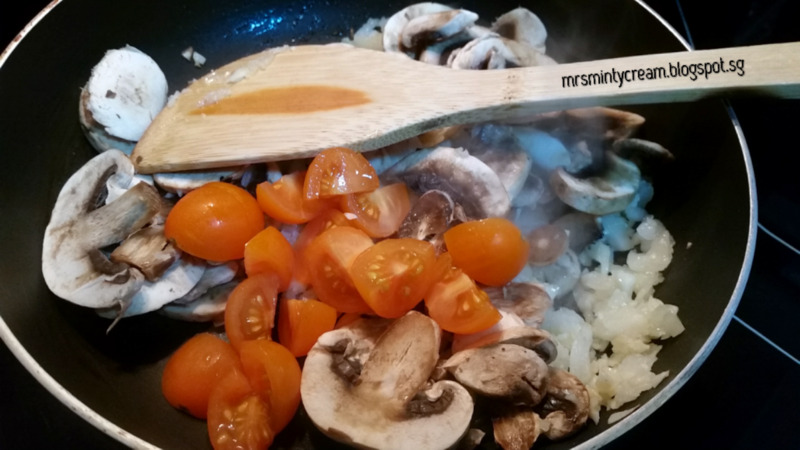 The splash of wine really built up the flavour and its fruity taste goes really well with my favourite, mushrooms! I feel so satisfied now(and ready for the rest of the day) after such a hearty and tasty sandwich! I totally see myself making more of such sandwiches very soon and in my next try, I am already decided that I shall be adding some cheese to go along with this recipe. Imagine the cheesy goodness together with the mushroom and chicken. Wow! 1. 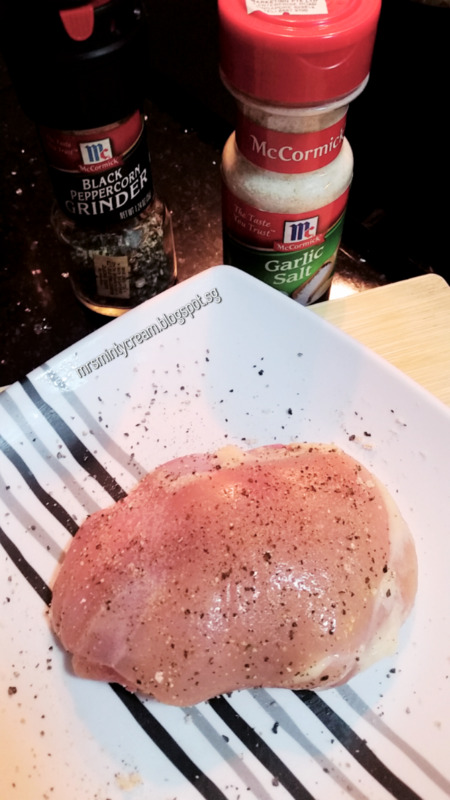 Season chicken thighs with garlic salt and black pepper to taste. 2. In a saucepan over medium heat, add in butter. 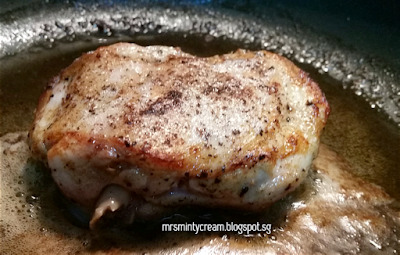 Sear chicken (on both sides), skin-side down until golden brown. Transfer to a plate. 3. Once chicken has cooled down, shred it into pieces. Set aside. 4. Add corn oil to the saucepan and lower heat to medium. 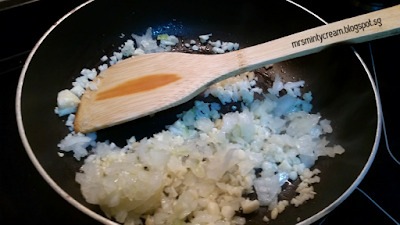 Cook onion and garlic until they are fragrant. Stir well. 5. Add in mushroom and cherry tomatoes and cook for 5 minutes until they soften. 6. Add in wine and chicken stock before seasoning with salt and pepper. Cook for another 1 to 2 minutes. Set aside. 7. Lightly butter the bread. Using air fryer, toast the bread at 160C for 2 to 3 minutes until it is lightly browned. 8. 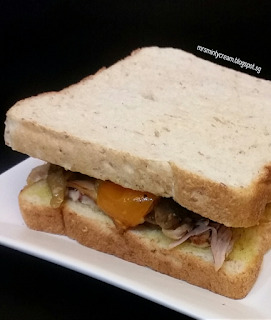 Remove bread from air fryer and start assembling the sandwich with the shredded chicken (Step 3) and mushroom mixture (Step 6). 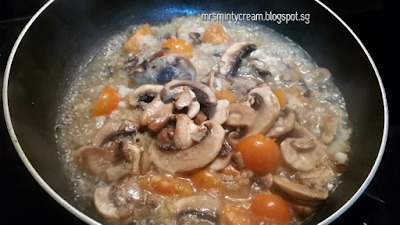 I love mushrooms and so the recipe that includes it :). This sandwich looks appealing and yummy. Me too! Anything with mushrooms is great for me! This sounds delicious right now. Might just have to do this for dinner. We have a rotisserie chicken to use and this might be an easy way to use it up. You totally should do that! Easy and yummy dinner! Love a perfect sandwich like this on busy days! And love your step by step photos! Thanks for sharing a yummy dinner! Yum! I love the combination of mushrooms and chicken...classic!! I love mushrooms, and I love sandwiches! So this is perfect! Yum! I love chicken and mushrooms but never thought to put them together in a sandwich! These look so good. I love chicken and mushrooms together. Nothing beats a great sandwich. Oh bummer, sorry to hear you weren't feeling well and hope that you've fully recuperated by now. 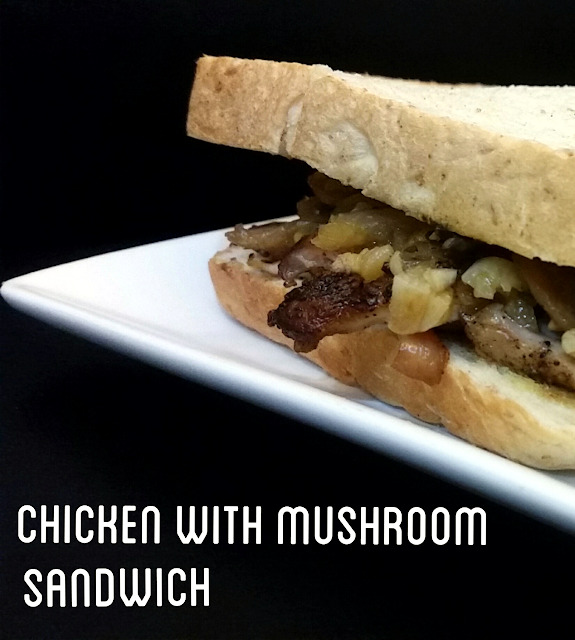 I can just imagine how flavorful this sandwich would be with the bread soaking up all the lovely juices from the chicken and mushrooms. Aww, thanks for your sweet concern. Am feeling so much better. You can totally right about the flavour of the sandwich. Yum! Yum! A sandwich made of my 2 favourite things: chicken and mushrooms. Thanks for sharing!! I am a big mushroom fan and this combo sounds amazing!